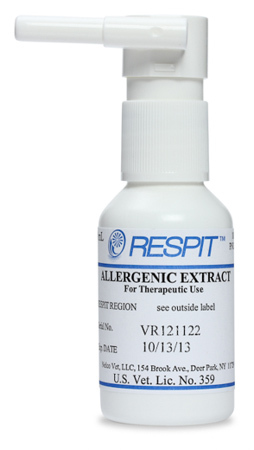 RESPIT, regionally-specific immunotherapy, is the practical allergy immunotherapy alternative that you can prescribe for atopic dermatitis in dogs and cats without allergy testing. 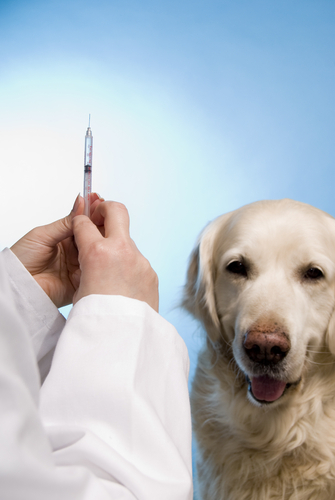 I recently conducted a survey of all 160 veterinarians who had prescribed RESPIT Injectable prior to September 30, 2012. (That number is now over 500, but we wanted to hear from those that had had a chance to follow up patients for at least 9 months.) I asked veterinarians to assess the efficacy and safety of RESPIT in each of their patients meeting certain inclusion criteria, and also asked some questions concerning their overall impression of RESPIT. I am going to share the patient-specific information elsewhere, but here are the overall impression results from the 15 veterinarians who completed the survey. 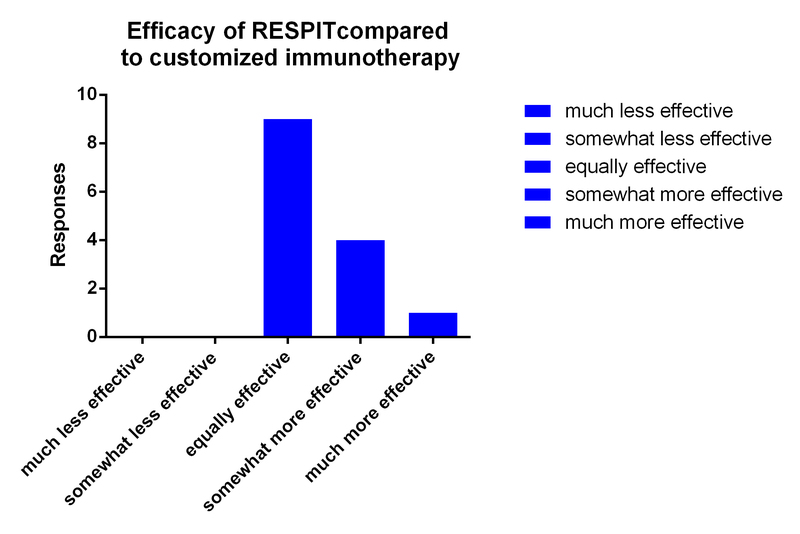 100% of veterinarians responded that RESPIT is equal to or more effective than allergy-test based immunotherapy. 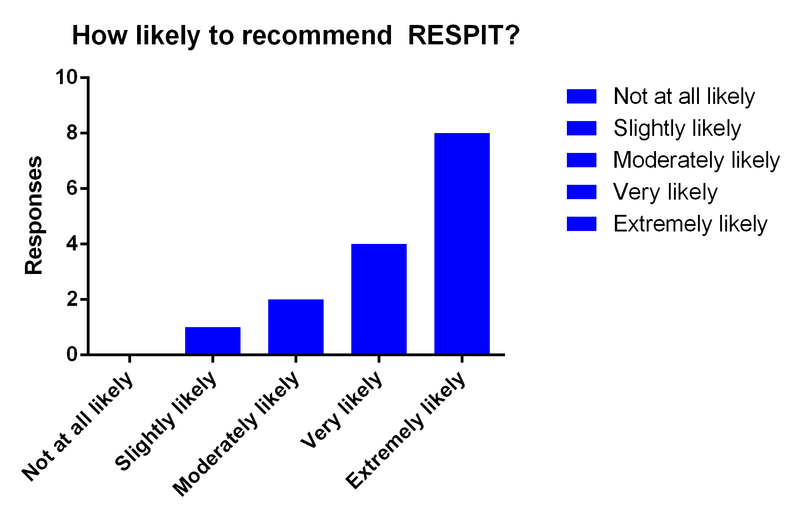 80% of veterinarians responded that they are very likely or extremely likely to recommend RESPIT to a colleague. 100% considered adverse reactions with RESPIT to be equal to or less frequent than with immunotherapy customized based on allergy test results. Why aren’t there more randomized controlled trials on allergy immunotherapy in dogs? Long before I developed regionally-specific immunotherapy (RESPIT), I was interested in studying the efficacy of allergen-specific immunotherapy (ASIT) in dogs. Why? The only placebo controlled study on ASIT, although a noble effort, had some serious limitations.1 First, there were no validated outcome measures available to the investigators at the time. Ad hoc pruritus scores (0-9) and lesion scores (0-8) were combined into a single score. Whether or not the investigators accurately captured what they were trying to measure cannot be known. Medications for the control of secondary infection were not permitted. And most importantly, there was no intent-to-treat (ITT) analysis performed. By the time (15 months) that a significant difference in clinical scores was found between the groups, only 5/24 dogs remained in the placebo group and 11/27 dogs remained in the treatment group. ITT analysis, whereby the last score of cases that dropped out is carried forward, may have led to a different conclusion. Those that failed to respond would seem to be the most likely to have dropped out, so this is a significant flaw. By 24 months, 5 dogs in the placebo group would be characterized as 100% improved at some point in the trial. This study also utilized a form of allergens (with an aluminum adjuvant) not generally used in the United States, where we use aqueous allergens in canine subcutaneous immunotherapy. So when dermatologists in the US cite this study as proof of what they are doing, that is taking some liberty. I don’t mean to pick on this report, because it is the best that we have. It nicely illustrates, however, the challenge we face in trying to study immunotherapy. We’ve had to take some steps back before we could proceed. I have gone through multiple fits and starts trying to design an immunotherapy study myself. One difficulty has now been surmounted. We have validated methods for scoring canine pruritus and lesions in atopic dermatitis. But even the first validated lesion scoring system (CADESI-03) was so cumbersome (248 evaluations per dog) that it prompted me to develop a more rapid scoring system (CADLI) rather than begin an immunotherapy study with the CADESI-03.2,3 The International Committee on Atopic Diseases of Animals, on which I serve, is still working on a medication scoring system that would allow us to provide and account for much needed concurrent treatment during lengthy atopic dermatitis clinical trials. The bottom line is that studying immunotherapy is difficult, but we are slowly getting the necessary tools in place to design more meaningful studies in the future. 1. Willemse A, Van den Brom WE, Rijnberk A. Effect of hyposensitization on atopic dermatitis in dogs. J Am Vet Med Assoc 1984;184:1277-1280. 2. Olivry T, Marsella R, Iwasaki T, et al. Validation of CADESI-03, a severity scale for clinical trials enrolling dogs with atopic dermatitis. Vet Dermatol 2007;18:78-86. 3. Plant JD, Gortel K, Kovalik M, et al. Development and validation of the Canine Atopic Dermatitis Lesion Index, a scale for the rapid scoring of lesion severity in canine atopic dermatitis. Vet Dermatol 2012;23:515-e103. 4. Hensel P. Differences in allergy skin testing among dermatologists within the same geographical region in the USA. Abstracts of the 7th World Congress of Veterinary Dermatology. July 24-28, 2012. Vancouver, Canada. Vet Dermatol 2012;23 Suppl 1:60. 5. Olivry T, DeBoer DJ, Favrot C, et al. Treatment of canine atopic dermatitis: 2010 clinical practice guidelines from the International Task Force on Canine Atopic Dermatitis. Vet Dermatol 2010;21:233-248. With the rapid emergence of methicillin-resistant strains of Stapylococcus pseudintermedius (MRSP), the potential for nosocomial infections should be addressed by every veterinary hospital with a formal, written infection control program. Most of the control measures for MR staphylococci are applicable to control of many other pathogens. These recommendations are of particular importance when dealing with veterinary dermatology patients, which have a relatively high prevalence of MRSP infections in many geographic regions. Surveillance. The most practical method of surveillance for veterinary hospitals is the passive surveillance of available data. A step that all veterinary hospitals can readily implement is compiling all culture data in order to identify disease trends. Environmental cultures, on the other hand, are a waste of resources. Cleaning and disinfecting the environment. Although we don’t yet know the role of environmental transmission of MRSP, it makes sense to treat the hospital as a possible source. Using disinfectants effective against methicillin-susceptible staph will kill MRSP as well. Products should be used at proper dilutions and with adequate contact time. Take special care to clean after patients known or suspected to carry MRSP. Personal protective equipment. Laboratory coats, disposable aprons and gloves are examples of PPE that is intended to prevent contamination of the wearer’s clothing or skin. These items may be underutilized in veterinary hospitals because we are afraid to offend owners. Hand hygiene. Either hand washing or alcohol-based hand sanitizers should be used before handling patients, after contamination of the hands, after removing gloves, and after patient contact. Patient flow and design. Ideally, dermatology patients, with a relatively high rate of MRSP infection, should be kept separate from other patient groups. This is not feasible in many hospitals, but one should consider environmental cleaning of common areas after dermatology patients. Judicious use of antimicrobials. Exposure to antibiotics is a risk factor for developing MRSP. Ideally, antibiotics are prescribed when needed, for only as long as needed, and at effective doses based on culture and susceptibility testing. A more detailed infection control discussion is available at www.wormsandgermsblog.com/promo/services. Hypothesis: immunotherapy with allergens not completely matched to sensitizing allergen(s) in experimentally-induced feline asthma can reduce aberrant immune responses. Methods: In phase I, 19 cats were sensitized to Bermuda grass (BG), housedust mite (HDM), or given a placebo. All cats then received BG immunotherapy for 6 months, beginning with a rush protocol. In phase II, 17 cats were sensitized to both BG and HDM, then received either placebo, BG, or HDM immunotherapy for 6 months. Bronchoalveolar lavage fluid eosinophils, antigen-specific lymphocyte proliferation, number of IL-10 producing cells, and percentage of regulatory T-cells were measured. Results: Both BG and HDM immunotherapy resulted in significantly decreased eosinophilic airway inflammation in BG-sensitized cats (p < 0.001), but not the placebo controls (p=0.221). In dually sensitized cats, single allergen immunotherapy with either HD or BG, but not placebo, significantly reduced airway eosinophilia (p = 0.038). Differences in IL-10 and regulatory T-cells were found between cats receiving placebo and single-allergen immunotherapy. Conclusions: Immunotherapy with allergens which do not completely match the allergen(s) used in asthma induction provided some degree of cross-protection. The mechanism may differ from that when immunotherapy is matched to sensitizing allergens. Comment: These findings are similar to a study in humans which found that imperfectly matched immunotherapy can be beneficial in the management of rhinitis and bronchial hyperactivity.2 Thus, there is mounting evidence that some of the benefits of immunotherapy are, at least in part, non-specific. This may partially explain why standardized immunotherapy for canine atopic dermatitis is similar in efficacy to customized immunotherapy, and how widely discrepant allergy test results lead to similar immunotherapy efficacy. 1. Reinero C, Lee-Fowler T, Chang C-H, et al. Beneficial cross-protection of allergen-specific immunotherapy on airway eosinophilia using unrelated or a partial repertoire of allergen(s) implicated in experimental feline asthma. The Veterinary Journal 2012;192:412-416. 2. Marogna M, Spadolini I, Massolo A, et al. Effects of sublingual immunotherapy for multiple or single allergens in polysensitized patients. Ann Allergy Asthma Immunol 2007;98:274-280. If you are recommending that your client spend several hundred dollars on an allergy test for their dog, it would be nice to have confidence that the test is reliable. It should demonstrate both test-retest reliability (repeatability) and inter-lab reliability (reproducibility). In human medicine, allergy testing companies are required to participate in an interlaboratory proficiency program using standardized serum pools. Unfortunately, such a program has not yet been adopted in veterinary medicine, although the International Committee for Atopic Diseases of Animals is working on it. This leaves us with relatively little information about which serum allergy test (SAT) to recommend. Over the years, most studies examining SAT reliability, including one I presented to the ACVD in 1994, have found most to be less reliable than desired. Since then, many of the companies have changed their methodology, although some do not readily disclose their anti-IgE antibody source or enzyme conjugate, which can profoundly influence results. Two more recent studies have been published. Thom et al. evaluated the reliability of three independent European allergen-specific IgE testing laboratories all employing Heska techniques and reagents. In terms of differences in reporting positive versus negative reactions, they reported a 3% intralaboratory discrepancy rate and a 9% interlaboratory discrepancy rate for the 3 labs. What I am unable to glean from this study, is how this would have differed from chance alone. If positive reactions were either very common or very uncommon, that would have a significant effect on the expected agreement. The kappa statistic is often used to account for this, but was not reported in this paper. In the second report, SAT results were compared between two labs that employ Greer macELISA methodology and also between Greer’s reference lab and Heska’s fceELISA test. Pools of sera were created from samples of known macELISA reactivity and duplicate samples submitted for each of the comparisons. Agreement was reported in terms of percent concordance of positive and negative reactions, and it was found to exceed 90% for both interlaboratory comparisons. Kappa was not reported, nor was the proportion of the 18 serum pools that had high, intermediate, or low (negative control) reactivity. Again, if the samples were skewed to very high or low reactivity, positive/negative agreement would look better than for samples with reactivity closer to the cutoff value. Following the second report, I submitted duplicate samples from two atopic dogs, with one sample going to Heska and the other to Greer. From one dog, both samples were negative. From the second dog, one of the samples showed no positive reactions, while the other lab reported several highly positive reactions to mites and one weed. I have since followed up on this finding by evaluating the agreement of four commercial allergen-specific IgE testing laboratories, both in terms of reported positive allergens, and allergens recommended for immunotherapy by laboratory personnel. A colleague submitted four identical samples from each of four dogs to different laboratories. Since each lab tests for a unique set of allergens, I examined the results a) as tested (ungrouped) and b) treating similar or cross-reacting allergens as the same (grouped). Figure 1 shows the total number of pairwise agreements and disagreements. The relatively high number of disagreements compared to positive agreements results in kappa values that are for the most part in the poor range (< 0.2), with just 1/6 lab comparisons displaying agreement in the fair range for treatment recommendations. I’m not able to present the entire study here, since I hope to publish it. Another way of putting it, 81% of the allergens recommended for treatment for these four dogs in their treatment sets were recommended by only one of four laboratories, and just 4% were recommended by 3 or 4. My bottom line: if you choose to send in a blood sample for serum allergy testing, your choice of labs has a major influence on their immunotherapy prescription recommendation, yet we don’t know which test is more accurate. Most clients are not keen on spending hundreds of dollars on a test if given that bit of information. Do you wonder about the specificity of allergen-specific IgE tests in dogs (the percentage of dogs not allergic to an allergen that are correctly identified as non-allergic)? Hopefully, you are using clinical criteria to make the diagnosis of canine atopic dermatitis (CAD), not serum allergy test results. Addressing this issue definitively is not as simple as it may seem, since there is no true gold standard to determine allergen-specific sensitivity. Several studies have reported results, however, that should give you a healthy skepticism about the specificity of serum allergy tests, even when considering the tests for the sole purpose of selecting allergens for immunotherapy, if not for diagnosing CAD. These false positive results may occur due to non-specific binding in assays or cut-off values that are set too low. Codner submitted serum samples from five normal greyhound dogs (http://www.vetrespit.com/resources/codner.pdf). Four of the five dogs had multiple highly positive reactions. In a recent report, 18 non-atopic West Highland White Terrier dogs were allergy tested. Multiple highly positive reactions were reported by the laboratory for 45 of the 48 allergens tested with the Allercept® test, leading the authors to conclude that the test was not specific for this population of dogs. Today, at the World Congress of Veterinary Dermatology in Vancouver, there was a nice presentation describing why horseradish peroxidase conjugated monoclonal IgE antibody should not be used in assays, due to the high level of non-specific binding which results with certain allergens. Some laboratories disclose the conjugate that they use in their assays, but others do not. The bottom line: do not use allergy test results to make a diagnosis of atopic dermatitis and don’t rely upon them exclusively for allergen selection for immunotherapy.